This post covers two all-seeded third round matches at the BNP Paribas Open in Indian Wells for Monday; Ana Ivanovic against Karolina Pliskova and Roberta Vinci playing Elina Svitolina. For a round-up of all the action from the women’s bottom half on Saturday, click HERE. Ana Ivanovic will be seeking her first ever win over Karolina Pliskova when the pair meet in the third round of Indian Wells on Monday. Ivanovic was one of four players on Saturday to win having saved match points; the Serb maintained a 100% winning record against Camila Giorgi but only just. She saved two match points, squeaking past the Italian for a 2-6 6-2 7-6(5) victory. Ivanovic was three times up a break in the decider before Giorgi got ahead on serve. The Italian player was hitting big; it’s awesome to see Giorgi in full flow and it really takes something special to put Ivanovic on the back foot. The Serb did a good job at staying in the moment and not getting freaked out by all the winners flying past her. With such an aggressive game, naturally errors will come and the match points were more about Giorgi than Ivanovic. Giorgi showed a few signs of nerves in the final set tiebreak with Ivanovic doing just enough to stay alive in the tournament. Pliskova arrived in the desert having lost her last three sets for the scoreline, 6-1. The Czech player had thrown in a pair of listless performances against CoCo Vandeweghe (6-7 1-6, Dubai) and Margarita Gasparyan (1-6 1-6, Doha). Pliskova has blown hot and cold for a while now as she competed so well in Fed Cup action before Dubai-Doha, helping the Czech Republic to a 3-2 victory by virtue of two singles wins and pairing up with Barbora Strycova in the decisive doubles rubber. After a lengthy break from the tour, particularly for Pliskova who normally plays a heavy schedule, she returned in Indian Wells with a much-needed win; she defeated Shelby Rogers, 6-2 6-4 and wasn’t broken once in the 64-minute contest. Ana Ivanovic outlasts Camila Giorgi, gets a tough win 26 62 76 to close out play. 40W, 47 UFE for Giorgi, 21 W, 21 UFE for Ivanovic. Head-to-head record: Pliskova leads Ivanovic in the head-to-head, 3-0, with victories in New York (7-5 6-4, 2014), Dubai (6-2 4-6 6-4, 2015) and Sydney (6-4 6-2, 2016). Roberta Vinci and Elina Svitolina both mounted superb comebacks in their second round matches to keep their hopes alive at the BNP Paribas Open in Indian Wells. Vinci saved two match points in a wonderfully wild second round match against Margarita Gasparyan, battling through, 6-3 6-7(7) 7-6(5). Vinci had a match point in the second set tiebreak, having stared down five set points of her own at one point. The Italian player then recovered from 0-4* down in the decider and saved match points at 4-5*. Gasparyan played some stunning points but tired towards the end as Vinci, the more stable player, attacked with her forehand and tried to come forward at every available opportunity. Vinci has begun to assert herself this year as one of the toughest players to beat on the WTA tour. The same could be said for Elina Svitolina who looked down and out at one stage in her second round match against Annika Beck. Svitolina was down 4-6 2-5, but fought back to win. Svitolina can be frustrating to watch at times with her passive nature, but she earns full marks for her ability to scrap and never give in. After coming within two points of defeat to force a second set tiebreak, Svitolina won 33 (!) of the last 41 points to seal a 4-6 7-6(0) 6-1 victory. The slow start could be attributed to a taxing week in Kuala Lumpur where she won the title against Eugenie Bouchard in a gruelling three set final. Roberta takes the battle of the one handed backhands. Head-to-head record: Vinci and Svitolina are all-square at 1-1 in their head-to-head; Vinci won comfortably in Beijing, 6-2 6-2, but Svitolina edged a tight three setter in Paris, 6-3 0-6 7-5 back in 2014. Final thoughts: Interesting match-up… Vinci would be the clear favourite in match play but I think the surface brings Svitolina up to a reasonably level playing field. Fatigue may be an issue for Svitolina although Vinci did have a marathon second round match herself. A little on the fence but leaning towards Vinci if she can maintain her aggression coming forward on a consistent basis. March 13, 2016 in Indian Wells, Ivanovic, Ka. Pliskova, Svitolina, Vinci, WTA. I think Ana is going to turn it on for this match. I didnt think Pliskova was impressive against Rogers and her game is becoming very one note. Ahhhh Ana lover, whatsoever Ana will win. It won’t happen this time, too. Ana was horrible in her previous match. She was gifted the match the erractic Giorgi. Pliskova form is not good although she got the win last match convincingly.But her previous results are very damaging.Ivanovic showing gutsy fight.Ivanovic in a tight three setter. Other one goes to Svitolina. Watching Vinci play, I hope she becomes a coach one day. She’ll do great with a player like Ostapenko. 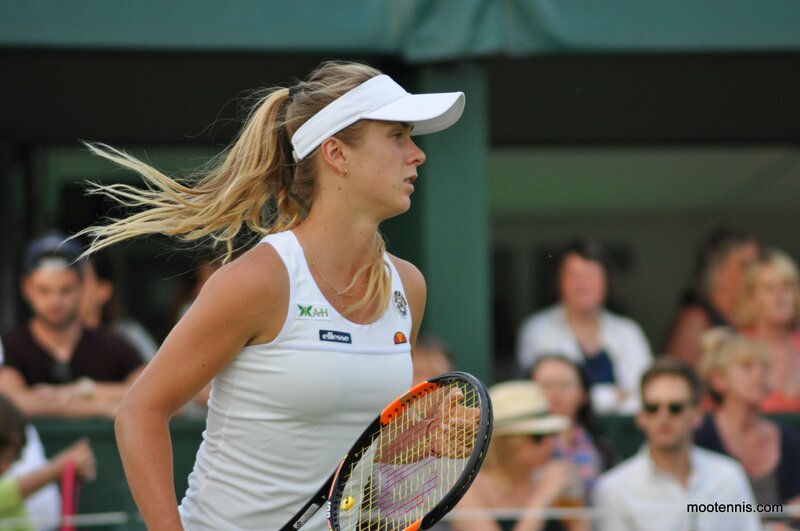 Svitolina had no response to her, the big match play and experience really showed. Elina does indeed look spent, probably should rest till the clay. As for a certain Ana, shambolic display. Kudos to Karolina, although the opposition wasn’t much to begin with, you can only play what is in front of you. I dont’ know, may be Ana needs some Zen Master to help her balance mind and body. Still, a match over in 49 minutes – good grief. Karolina’s match with Jo Konta (who also won her match today, against Denisa Allertova, in convincing fashion) should be eventful. I wish Ana hadnt played as her coach pointed out. But im pleased she got on with it without crying or getting pissy with the situation. Im tempted to say its Pliskova’s best match of the year although she didnt have much resistance. Her serve was on song and she was more creative in her shot making. I wish for a period when she is able to play as her complete self. It’s a real shame, cause for those brief times it happens, you can tell her body still has talent locked on. Just get the mind, attitude, and all in sync, peaking at the same time. Makes me miss the years of old when she was becoming, although it wasn’t perfect, you knew she was reaching for something. Now, she just gets me angsty, knowing she can basically lose to anyone. Karolina vs Konta may come down to error counts cause there will surely be some feisty hitting from both. I like Konta’s story so going by heart I hope her confidence sees her through.